Col. (Ret.) Gili Shenhar is a senior consultant in the Homeland Security arena. He is an expert in Emergency and Disaster Response assessment and planning and in Multi-Agency /Multi-Disciplinary Operational Response. He is an expert in Risk & Crisis Communication planning and solutions. He is involved with R&D in this field, while doing emergency management consulting. Shenhar is the programs academic coordinator and a teacher at Tel Aviv University, the executive master’s programs for Emergency and Disaster Management. He is a senior researcher at the Israel Center for Trauma and Emergency Medicine Research, Gertner Institute. 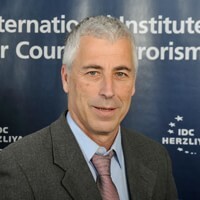 He is an ICT (International Institute for Counter terrorism) research associate and is also teaching at interdisciplinary center IDC Herzilia and in Haifa University. Shenhar is a senior officer in the, HFC, IDF (as a reserve officer). Since 2007 Shenhar is also an UN expert in UNDAC. Shenhar retired Colonel from Israel Defense Force (IDF) serving in active duty from 1976 to 2003. Shenhar has more than thirty years of management experience. He was a leader of Doctrine and Development, R&D units, and operational organizations during his service in the IDF. He served as Senior Advisor to the Commander of the IDF Home Front Command during Operation Iraqi Freedom. His previous position was Head of Doctrine and Development for the IDF Home Front Command where he took part in preparing the Israeli population and relevant organizations for the potential consequences of Operation Iraqi Freedom. During the 2006 conflict he was called back to assist the Home Front Command with planning and executing Risk Communication and other activities for the civil population. During the 2009 and 2012 conflicts in the south (Cast Lead & Pillow of Defense), he was called back to be a senior spokesman for the HFC. Shenhar has been a part of several delegations to disasters area with the IDF and as a part of UNDAC. He received his MBA from the Tel-Aviv University in 1999.